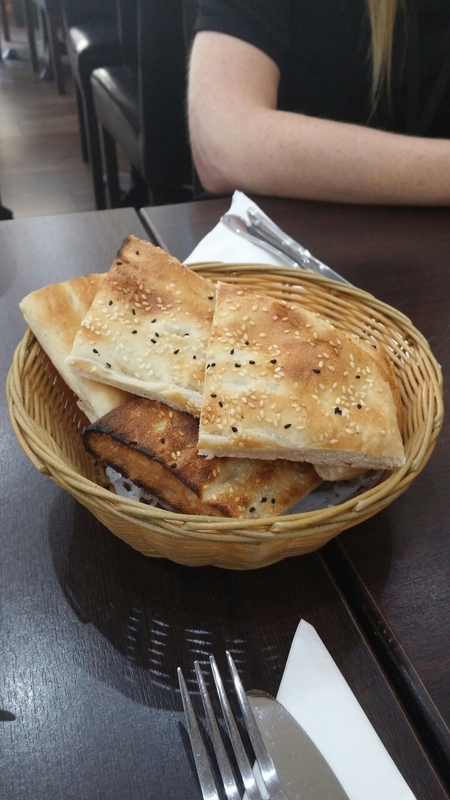 Turkish food often gets a bit of a bad rap, as against other Eastern Mediterranean cuisines. Look how popular Lebanese and more recently Syrian food has become. A shawarma is viewed as a lovely thing whereas a donar kebab often fills most non drunk people with dread. The profusion of awful kebab houses when I was a student in Cardiff (I recall waking up – the morning after a heavy night out – in an armchair congealed kebab still in hand and a white grease mustache on my upper lip on one occasion), have been replaced by more sophisticated Turkish/Middle Eastern joints. 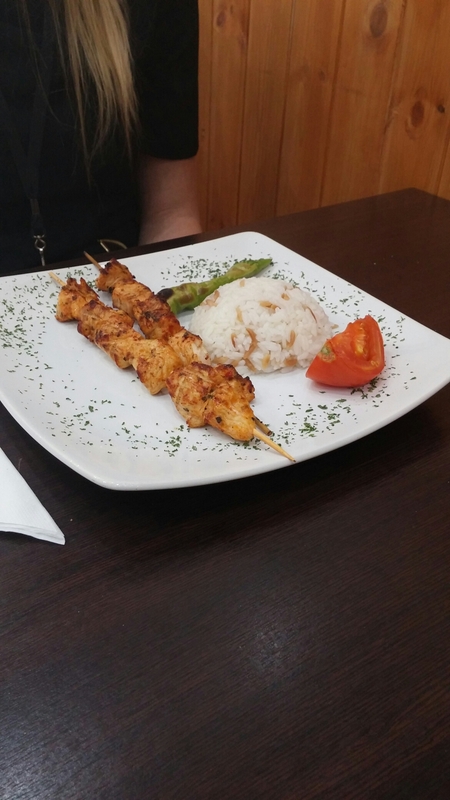 City Road, with places like Oz Urfa, Troy and Saray, is quality Turkish kebab central in Cardiff. I regrettably don’t get to City Road much (it being the otherside of town to where I live and not really walkable for lunchtime from my work) so have missed out of these places. I really do need to get out more!!! 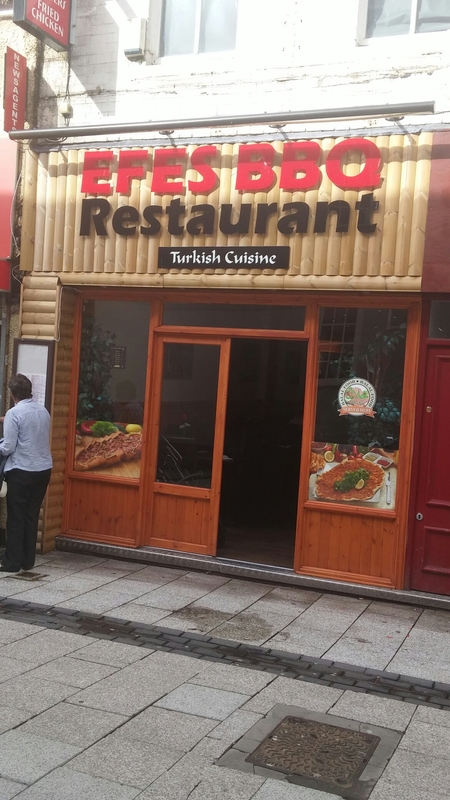 J is very keen on Turkish food so when I spied a new Turkish restaurant (in the form of Efes BBQ), on the corner of the Hayes and Caroline Street in Cardiff City centre, it immediately went on the list of places to visit for lunch. I must admit I am not at all convinced that Caroline Street is the best place to locate a Turkish restaurant. To those that don’t know Cardiff, Caroline Street is an area where late night fast food (including kebabs) dominates. The presence here of a Turkish Restaurant may lead to it being associated with a late night fast food kebab takeway joint rather than viewed (as it really should be) as a sit down restaurant open for lunch and dinner. The fact that no one was in there when we walked in at 12.15 on a Wednesday afternoon, perhaps, adds credence to this theory. Having said that, it started to fill up once around the 1pm mark. It is nice enough inside if a bit utilitarian. A table of two who came in a bit after us were, when we left, tackling an enormous mixed grill platter. 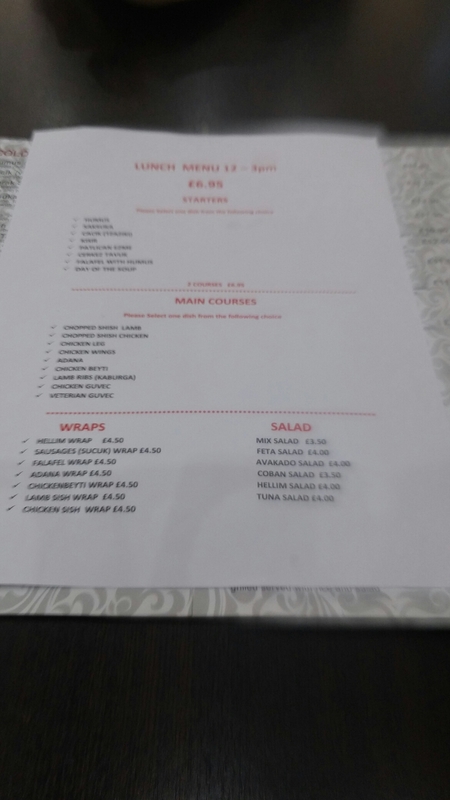 I was, however, interested in their fixed price 2 course lunch menu (£6.95). Love a bargain me. 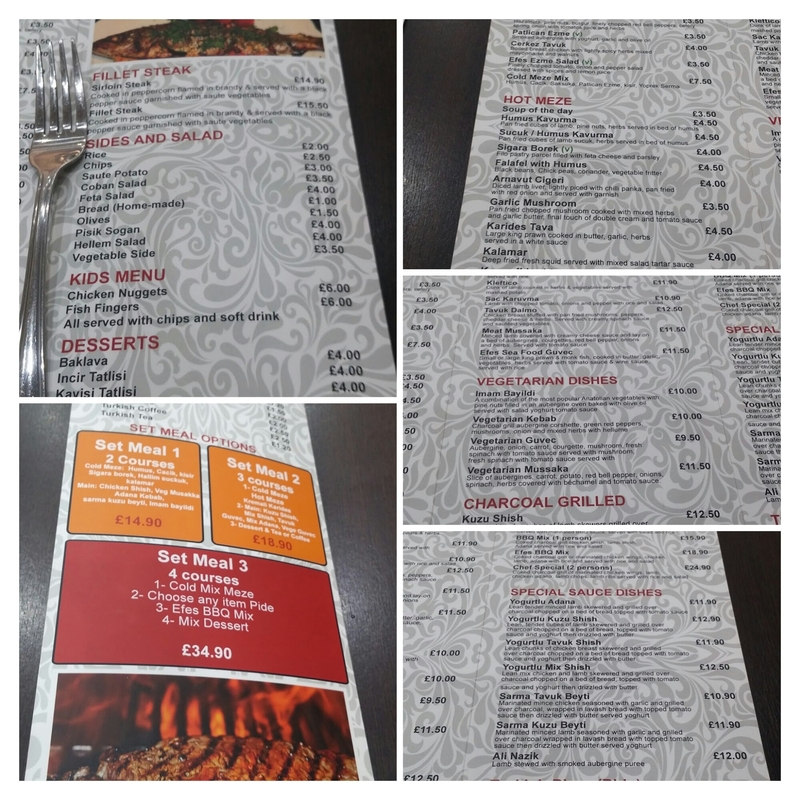 but if you are not au fait with Turkish food you will need to cross reference as against the main menu for explanations of what stuff is on it (some are obvious, others are not so much and we needed to look up some). 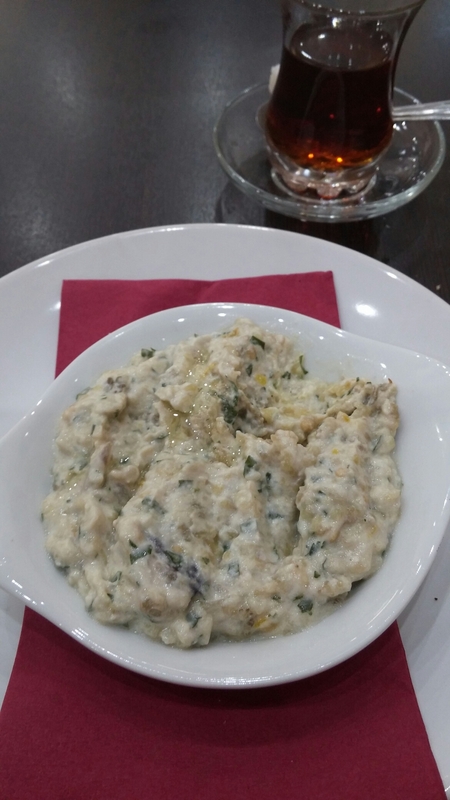 This had a pleasant smokiness to it and was great on the plentiful and very nice warm flat bread supplied with the starters. J went for the falafal with hummus. Textbook stuff here with three crispy hot flavoursome balls of chickpea and herbs sat atop a really good and plentiful amount of hummus. No photo of this am afraid (thought took one, but phone said nope). 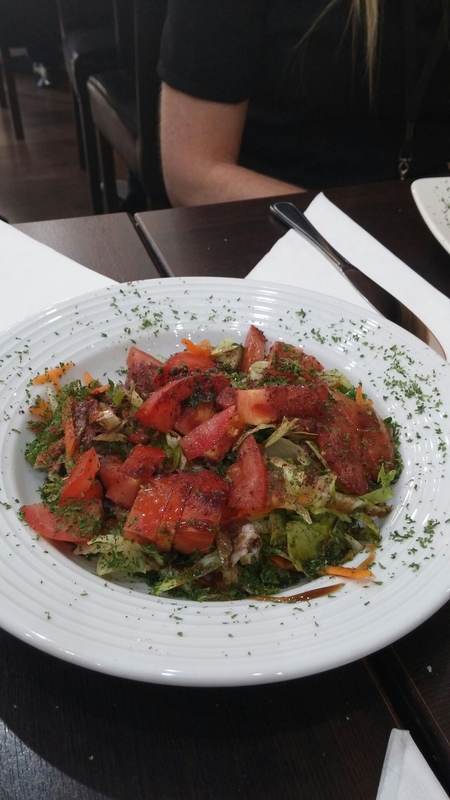 Along with the bread, a rather nice mixed salad also turned up with the starters. Predominately tomatoes, cucumber and onion, it had loads of herbs running thought it and a very good dressing. Very nice and refreshing, with tomatoes that actually tasted of tomato (rarer than it should be that). 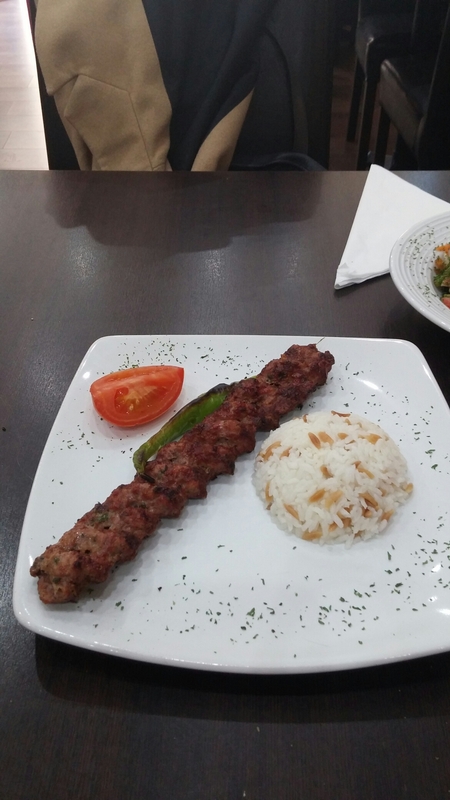 For mains, I had the Adana – a long spicy minced lamb kebab, with good buttery rice laced with almonds and a couple of pieces of grilled veg. (a tomato quarter and a chilli that was a bit hotter than I expected – being a complete wuss I had to ask for a glass of water). The Adana was nicely spiced with a bit of heat, but not too much, and had a good char on the outside and a juicy interior. A decent size portion for a fixed price menu I thought. This comprised two good sized skewers of cubed nicely spiced chicken (well J said they were – my request to try one was refused) with the same veg and rice combo I had. A further full basket of hot flat bread arrived with the mains, as did a choice of garlic and chilli sauces (the first one very garlicy, the second one with a bit of an afterburn). 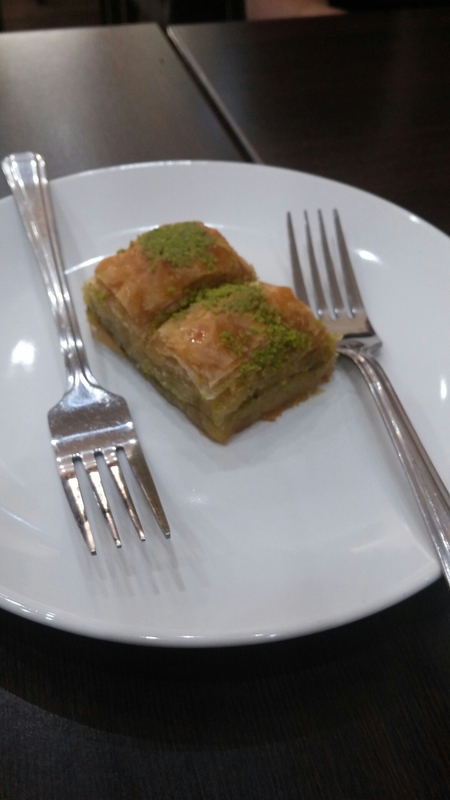 Whilst we were both pretty much stuffed after the mains, the waiter (who was very congenial and helpful) delivered up (free) some rather nice baklava. This was really good with loads of pistachio and syrup. 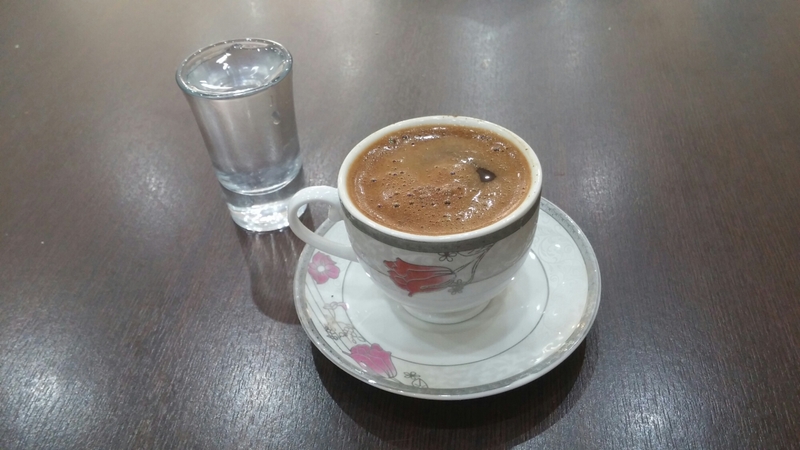 They have a pretty short drinks menu, with the usual suspects, as well as Turkish tea, Turkish coffee and Aryan (a Turkish yoghurt drink with salt, which sounds a bit like a lassi). 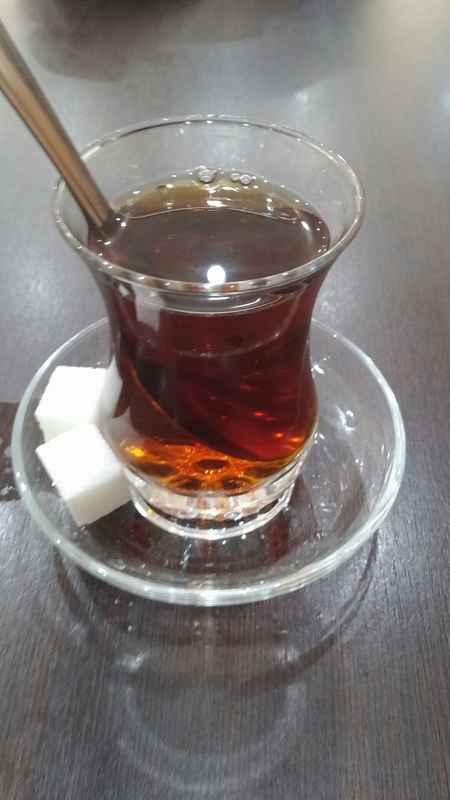 I went for the Turkish tea (£1.20), thinking it would be mint, which turned out to be a black tea. It was nice enough. 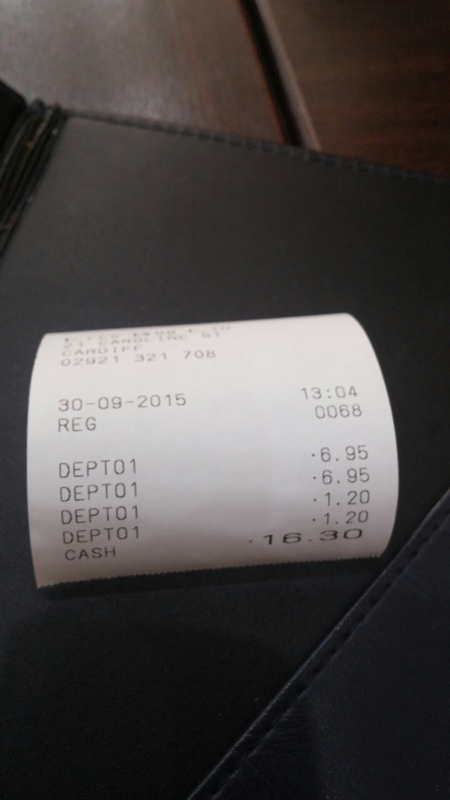 J went for boring old diet coke (£1.20). Lovely sweet, thick, black as midnight and sludgy at the bottom – just how I like it. We were slightly worried that the shot glasses, that appeared with it were, that Turkish firewater, Raki. Not conducive to an afternoon of work, Raki! This place appears to operates on a no booze basis and thus our fears were unfounded as it turned out to be a shot of water to chase/dilute the coffee (if needed). A crackingly good meal and an absolute steal for the £16.30 in total we paid for all the food and drinks. 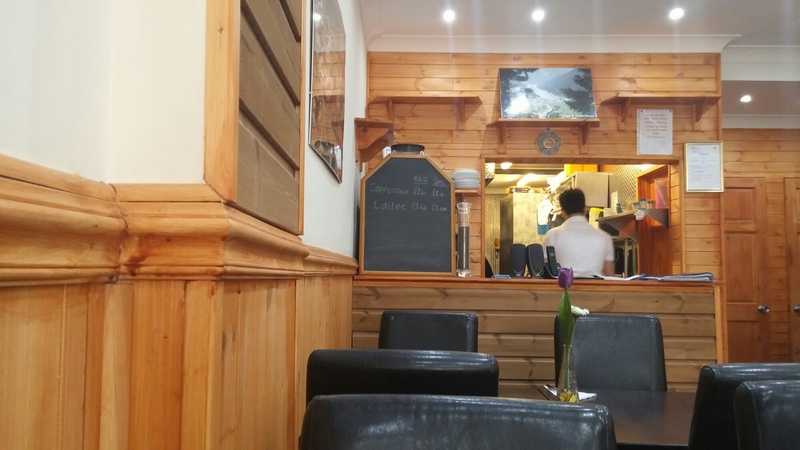 Even if you take into account that they very nicely gave us the two coffees and the baklava free (I did query the bill saying they seemed to have undercharged us – honest me see – which was met with a wave of the hands and a request to “come again”) this is a bargain lunch time offer. They got a good tip. Would I go again? Oh yes, good food at a great price and lovely people. I hope they do well, notwithstanding my slight misgivings as to the chosen location. They certainly deserve to as, on the basis of my visit, it really is a “Turkish delight”. I couldn’t find a telephone number or a website address or any sign of them on social media. 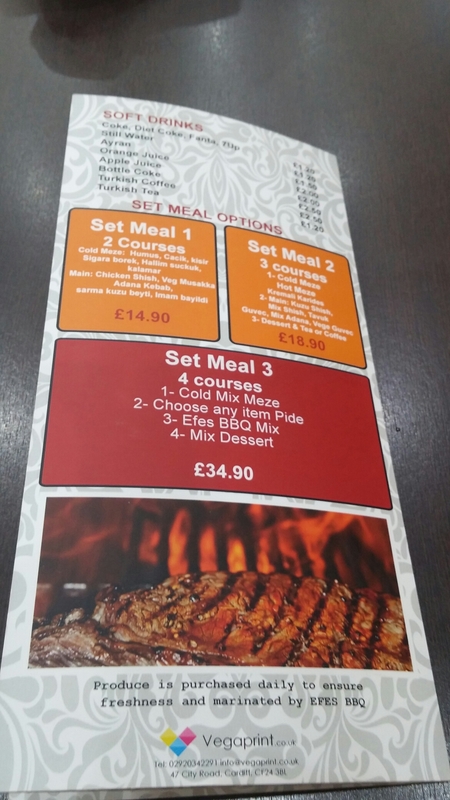 This entry was posted on Oct 11, 2015 by solicitingflavours in BBQ, Cardiff, Cardiff restaurant, coffee, Drink, Efes BBQ, Fixed Price Menu, Food, lunch, lunchtime, New restaurant Cardiff, Non alcoholic drink, Restaurant Review, review, Tea, Turkish, Wales.